The Nunchuk Controller to Control Voltage Adapter began as an experiment with a Nunchuk Controller as an unconventional interface for musical expression. I created a pair of these as part of my entry to the 2018 Moog Circuit Bending Challenge. 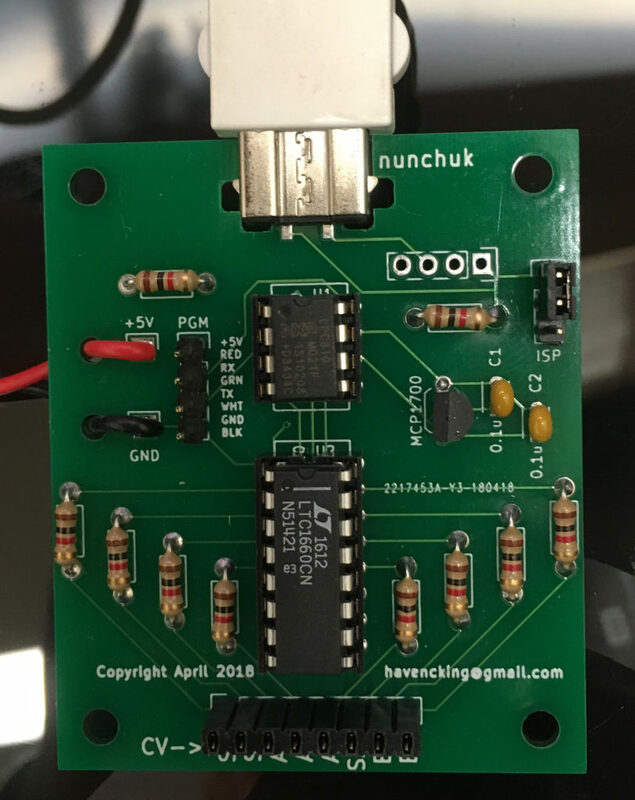 After using the pair to control a drum machine I wanted to make some more to interface with other synthesizers, and I wanted a proper PCB so that the Nunchuk Controller could be attached using the existing plug. You will need to provide your own official Nintendo (white) Nunchuk Controller. From what I’ve read, non-white and/or non-official controllers use different startup sequences, and my code only accounts for the official white controllers. I got mine shipped for less than $10 at amazon.com. The board is powered by a GND line and a +5V line. The pads are clearly labeled on the left side of the board. It can be powered from any typical clean +5V synth power connection, like a Eurorack power supply or a +5V line from a Moog Werkstatt circuit board. I’ve personally had bad results (didn’t fry the board, but it didn’t work) with trying to power it from a USB port due to how noisy USB power is. The Nunchuck connector is plugged on the top of the board with the notched side up. The fit is snug, so take care to ease it into place. It is not intended to be hot-plugged (unplugged or plugged while powered). It probably would not hurt anything, but it probably wouldn’t work either.